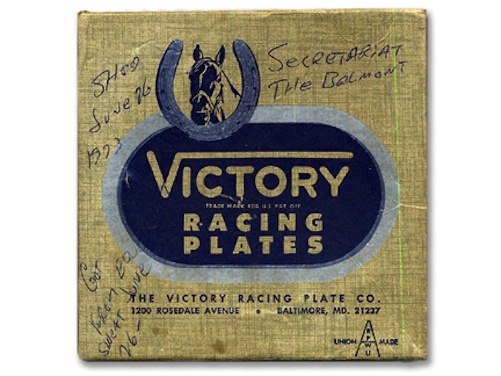 In conjunction with the 2013 Secretariat Festival and for the first time in 5 years Secretariat.com is proud to offer an original horseshoe nail from Secretariat's 1973 Belmont Stakes victory documented with an impeccable provenance. 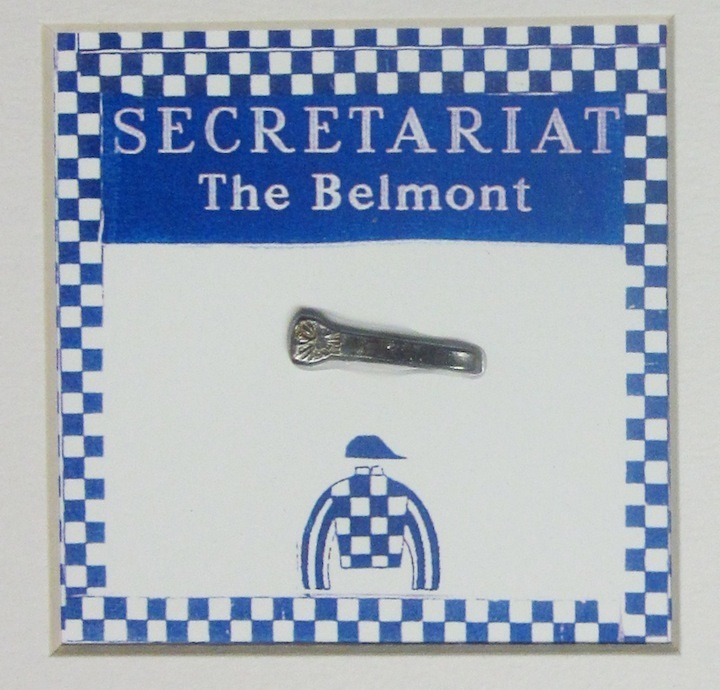 The Belmont nail, titled #sec060973jgfr3, is part of a framed montage created by the late Jim Gaffney. Mr. Gaffney was the exercise rider for the heralded Meadow Stable and was intimately involved with the day-to-day activities of Secretariat in 1972-1973. His experiences with Secretariat are chronicled and verified in William Nack’s book, “Secretariat, The Making of A Champion”, published in 1975 (chapter 10, beginning page 73), as well as Raymond Woolfe’s book, “SECRETARIAT”, published in 1974. Mr. Gaffney, along with groom Eddie Sweat, held Secretariat whenever he was shod and began acquiring the shoes and nails of the great champion from his maiden race forward. 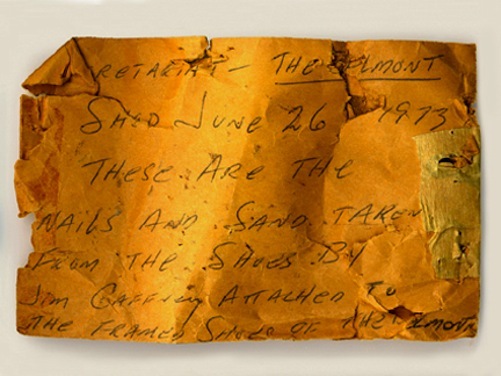 The featured nail was obtained on June 26, 1973, when Secretariat was re-shod, seventeen days after winning the Belmont Stakes by 31 lengths, setting a new and still existing world record for 1 1/2 miles on dirt to complete his Triple Crown sweep. The performance was perhaps the most defining race in Secretariat’s career, and considered one of the top ten sporting achievements of the 20th century (Sports Illustrated, 2004). Nail #sec060973jgfr3, one of only a handful to exist - each individually cataloged and officially documented - was initially sealed inside a brown envelope within the original shoe box (additional images shown with the original 1973 hand written notes from Mr. Gaffney documenting the shodding and acquisition date) from the Victory Racing Plate shoe company which supplied a variety of Secretariat’s shoes throughout his career. The nail has been kept in protected storage in the continued possession of either Mr. Gaffney or the Secretariat Archives since its acquisition. The provenance and rarity of the nail makes this a wonderful investment opportunity for any serious sports memorabilia collector. Another nail from this same Belmont Stakes nail group was auctioned to the tune of $7500 and featured in the May 2006 issue of the Antiques Roadshow official publication, "Insider". And the historical significance of the nail cannot be overstated as the corresponding set of Belmont shoes in which the nails were removed reside in the collection of the National Museum of Racing in Saratoga Springs, New York. Accompanying the nail within the 12" x 12" framed montage hand-signed by Secretariat's owner Penny Chenery is an illustration of the Meadow champion by Richard Stone Reeves, hand-signed by Hall of Fame Jockey Ron Turcotte, and a small image of Secretariat’s Belmont Stakes victory. Mr. Gaffney personally assembled the framed collection in 2004 and a certificate of authenticity will be provided to the winning bidder. This item sold for $7200, thank you to to all bidders.